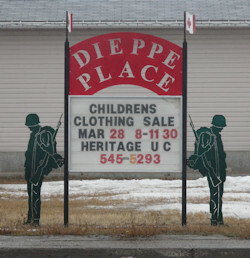 Our community sign is in a high-traffic location on the corner of Dewdney Avenue and McCarthy Boulevard. Personal: 2 days $10, 5 days $20. Civic and non-profit groups: 2 days $20, 5 days $40. Commercial: 2 days $30, 5 days $60. Contact Kim Young to place your announcement. Contact to place your advertisement.